On June 18, 2017, the Syrian Army General Command announced that U.S. F/A-18E Super Hornet had shot down one of aircraft the Syrian Air Force fighter jet. Syrian Ministry of Defense also stressed that the incident had taken place near a village called Rasafah while the aircraft had been carrying out a combat mission against ISIS terrorists. In their turn, the representatives of the Coalition Command traditionally said the jet had dropped bombs near the US-backed Syrian Democratic Forces (SDF). It should be mentioned that it isn’t the first time when the U.S.-led Coalition attacks the government forces in Syria. Over the past month, the U.S. Air Force has struck at the pro-government forces for three times in the city of At-Tanf. In this regard, the Coalition is accused of supporting terrorists. Besides, it seems quite strange that since the beginning a ‘counter-terrorist” operation in Raqqa, ISIS terrorists often hand over occupied areas to the SDF and the U.S. Special Forces without any fight, and then they freely go towards the Syrian Army’s positions. 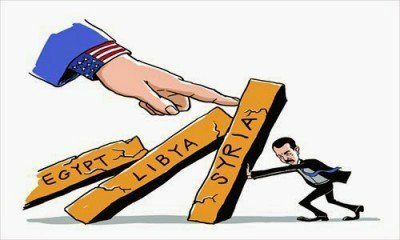 Syrian Ministry of Defense also claimed that the U.S. aggression confirmed that Washington supported terrorism and, at the same time, tried to weaken the capability of the Syrian Army (SAA), which together with its allies was the only effective force fighting terrorism in the country. It is noteworthy that not only Damascus strongly criticized the actions of the U.S.-led Coalition. Despite all the statements of the Central Command, Iran and Russia said that the Western Coalition prevented the prompt destruction of ISIS terrorists. Nowadays, it becomes obvious that the U.S. main aim is not elimination of the terrorists. Washington intends to take full control over Raqqa. Providing terrorists with the right to leave the city is another confirmation of that. According to many Syrian experts, if Washington manages to capture Raqqa, it will be able to justify an impressive number of civilian casualties suffered as a result of the Coalition’s indiscriminate air strikes. Moreover, to achieve its main goal Washington uses the SDS troops. However, the question arises – what price of such cooperation will be for Kurds? According to sources, carrying out the U.S. orders, the SDS units intend to cut the Syrian Army off from the road to Deir ez-Zor. They plan to launch an offensive from the town of Resafa. This will make it more difficult for the government forces to attack positions of ISIS terrorists. In addition, clashes between the Syrian army and the Kurdish units of the SDF also take place in the Jaidin village south of Raqqa. Most likely, Washington plans to turn the government forces and SDF against each other. Certainly, it will help terrorists in strengthen their capability and escalate the situation not only in Syria, but throughout the Middle East.